What Are the Best YouTube Video Dimensions for Uploading? What are the best YouTube video dimensions/size for uploading? – Here's the answer. If you are looking for the current standard YouTube video dimensions for uploading to get the most satisfied YouTube video viewing effect, you come to the right place. In this post we provide you best YouTube video upload settings, including best video dimensions for YouTube, YouTube upload video formats, duration, file size, resolution, codec, etc. And will teach you how to use a best YouTube video editor to convert and edit the video to get the optimal video dimensions for YouTube uploads. * Allow you to adjust video audio parameters like video resolution, aspect ratio, video audio codec, frame rate, sample rate and bit rate with ease. * Video editing features like trimming, cropping to remove black bars, expanding, merging, adding subtitles, etc. are all at hand. * Free download 8K/4K/HD/SD videos/movies/music from YouTube and 300+ sites and convert them to MP4, AVI, MP3, iPhone, iPad, Android, etc. 410+ preset profiles. Best YouTube Video Dimensions for 8K/4K/1080p/720p HD Videos, etc. The most suitable video dimensions for YouTube uploading are depending on different YouTube video resolutions. Here we list some commonly used YouTube video dimensions of different resolution videos. Please be aware that the best YouTube video dimensions above for upload can assure you most ideal video result on condition that they are in 16:9 aspect ratio. If your video is in 4:3 ratio, you can first learn how to change video aspect ratio from 4:3 to 16:9 for wide screen display before upload to YouTube. After you dig out the best YouTube video dimensions/resolutions/aspect ratio, in order to upload highest quality YouTube video, we also suggest you pay attention to other upload YouTube video settings below, including best video formats for YouTube, video audio codec, duration, file size, frame rate, bitrate, etc. Duration and file size: Up to 15 minutes/one video. If you use an up-to-date browser, you can upload 20GB, if not, 2GB video file size is the limit. Recommended frame rate: You'd better not change the frame rate and make sure the encoded and uploaded video is in the same frame rate it was recorded. Bitrate: Bitrate is not as important as other settings for common uploading. If you are an advanced user, you can check more detailed recommended YouTube upload encoding settings (Advanced) from YouTube Help page. To make your uploaded YouTube video look perfect, you'd better convert videos to the best video dimensions/sizes and edit the video to match the best YouTube video settings. To realize this, you need a reliable professional video converter which must also be a best YouTube video editor. 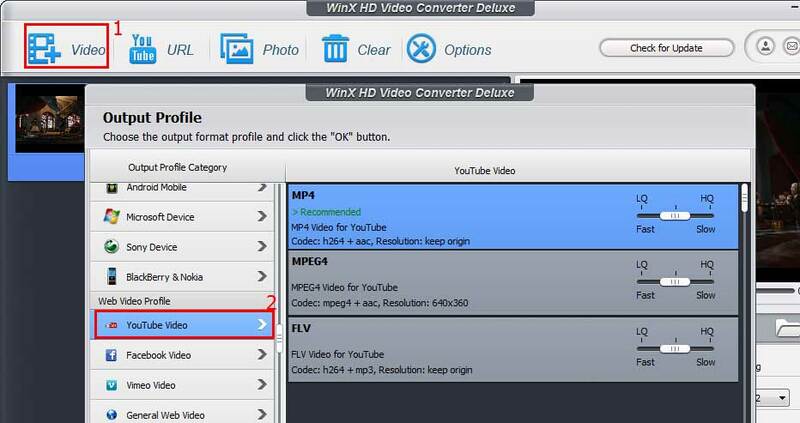 WinX HD Video Converter Deluxe helps you convert videos directly to YouTube supported formats as MP4, FLV, 3GP, WebM, etc. and aid you to edit video audio parameters including video dimensions, resolution, aspect ratio, frame rate, sample rate, bitrate, etc. Free download, install and run this all-in-one video converter and editor on your PC and follow the 4 simple steps below to convert video to fit best YouTube video dimensions. Step 2. Convert video to best video format and video dimension for YouTube. Click: Output Profile > Web Video Profile > YouTube Video > MP4. Then click the wheel-like icon to set or change the video audio parameters. Step 4. Tap "RUN" to start converting videos to best YouTube video dimensions for uploading. A top-notch all-in-one video converter, video editor, 300+ sites video downloader, to help you easily convert any 8K/4K/1080p/720p HD/SD videos to best YouTube video dimensions for uploading, or free download any favorite video/movie/music from YouTube, Vimeo and more. YouTube: YouTube now operates as one of Google's subsidiaries. The site allows users to upload, view, and share videos, and it makes use of WebM, H.264/MPEG-4 AVC, and Adobe Flash Video technology to display a wide variety of user-generated and corporate media videos. 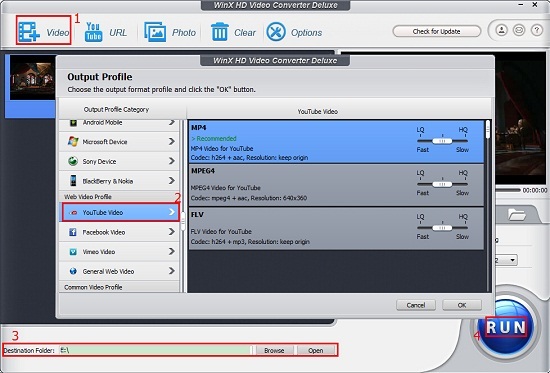 Convert YouTube Videos to AVI, MPEG, FLV, etc.